From the age of seven years when the dentist advised my mum, I was very conscious that I had an overlapping jaw. In recent years it was interfering with my social life and I was always hiding it from my friends. I felt it was very prominent and I got a quite an amount of slagging about it. 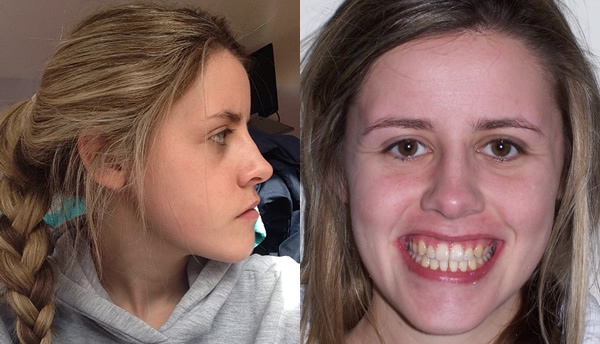 Following a visit from a HSE dentist to my school when I was aged 15 years old, I was referred to Dr Sinead O’Hanrahan, Specialist Orthodontist, Navan and HSE Orthodontist (and President, OSI) and I was delighted when she said something could be done about my overlapping jaw. Sinead recommended that I should have braces first for two years through the HSE public orthodontics system. Then I would have surgery to correct both of my jaws performed by Mr Dylan Murray, Craniofacial and Jaw Surgeon, Temple Street Children’s Hospital and the Mater Hospital. I met Mr Murray several times before my surgery and the surgery took place in the Mater Hospital in mid 2013. My experience of my orthodontic treatment was also very consistent. I was reviewed at regular intervals and my orthodontist was extremely helpful and understanding. I am delighted with the results. I feel much more confident about myself. It was well worth the experience and I would do it again if I had to!